This meaty favourite has been given a vegan makeover with the use of vegan mince and cannellini beans. 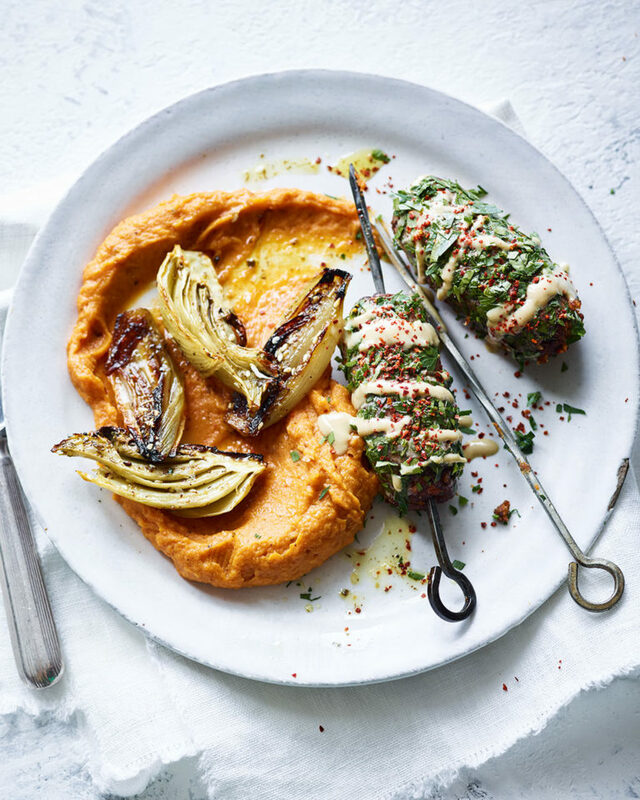 Served with sweet potato mash and roasted veg, it makes an impressive midweek meal. Heat the oven to 200°C/180°C fan/gas 6. Put the sweet potatoes on a large baking tray, toss in a glug of oil and sprinkle with the chilli flakes (see tip). Put the fennel and shallots on another tray, drizzle with oil and season. Roast everything for 25-30 minutes until tender. Meanwhile, put the vegan mince, oil, shallots, baharat, beans and half the parsley in a food processor, then pulse until just combined. (If you don’t have a processor, mash with 2 forks in a bowl.) Shape into 8 cylinders and thread onto skewers. Put on a baking tray and brush with oil. Remove the veg and heat the grill to high. Grill the kebabs for 8-10 minutes, turning halfway, until browned. Sprinkle za’atar over the fennel and shallots and return to the oven for 5 minutes. Clean the processor, then whizz the cooked sweet potatoes with the beans and plenty of salt and pepper until smooth (or mash in a bowl). Keep warm. Buy aleppo chilli flakes in Turkish shops or at souschef.co.uk or use regular chilli flakes instead but use less, as they’re hotter. Za’atar and baharat are both available in large supermarkets. Shape the kebabs and make the mash a day ahead. Cover and keep separately in the fridge. Reheat the mash in a pan or microwave while you grill the kebabs.